Our approach is grounded in published research and informed by practitioner feedback. 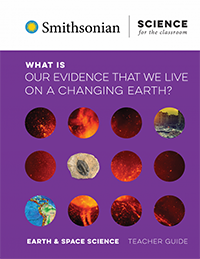 Smithsonian Science for the Classroom is designed to be a comprehensive core science program for grades 1–5. We divided the NGSS Performance Expectations (PEs) into four “bundles” that correspond to four modules in each grade. If all four modules are used within the year, then students should be prepared to meet all the NGSS PEs at that grade level. Within a grade level, the modules may be used in any sequence that suits your district or school’s needs. The modules are further organized into four topical “strands”: life science, Earth and space science, physical science, and engineering design. There is one module in each strand per grade level. While the strands serve as organizing themes, the modules themselves are interdisciplinary and always include PEs from at least one other topic. 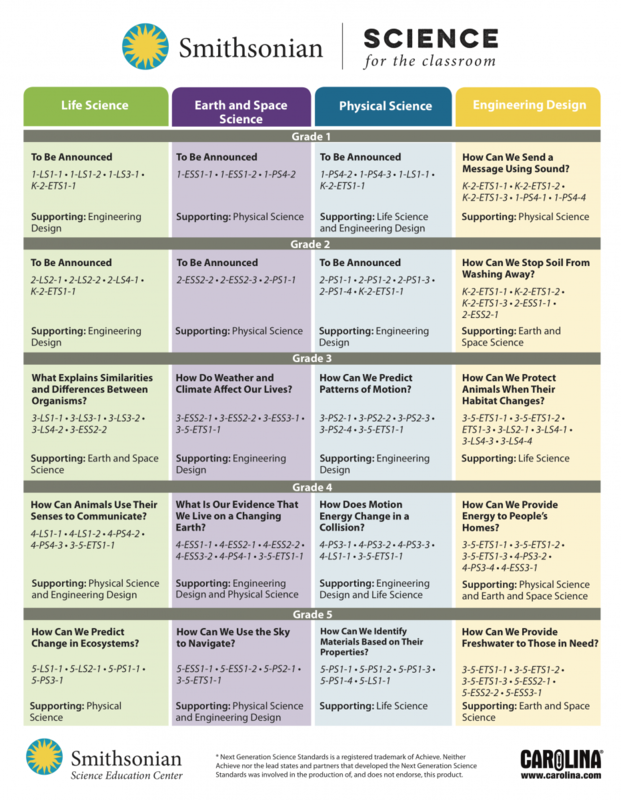 Crucially, all modules in the engineering design strand also include science PEs—many of which are only covered within the engineering modules. The intent of the NGSS is for students to learn science and engineering in an integrated way that reflects the real-world practices of scientists and engineers. Our program honors this intent by never treating engineering design in isolation from the scientific knowledge it is based on. The module titles are all phrased as questions. These questions serve to motivate students and tie together the concepts within the module’s PE bundle. The questions for the life, Earth, and physical science modules invite students to construct scientific explanations for natural phenomena, while the questions for the engineering design modules invite them to design solutions to practical problems. All modules have a culminating challenge—a science challenge or design challenge, depending on the strand—that serves as a performance assessment. 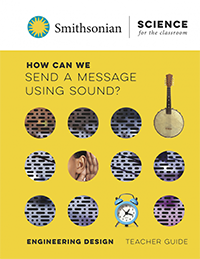 How Can We Send a Message Using Sound? Grade 1 K-2-ETS1-1 • K-2-ETS1-2 • K-2-ETS1-3 • 1-PS4-1 • 1-PS4-4 Different solutions need to be tested to see which one best solves the problem. Students carry out research into parts of a banjo. They build a banjo by testing different banjo parts and argue from evidence which materials make the best banjo sound. 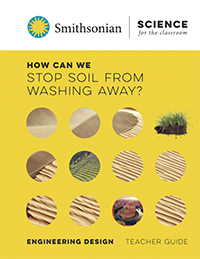 How Can We Stop Soil From Washing Away? Grade 2 K-2-ETS1-1 • K-2-ETS1-2 • K-2-ETS1-3 • 2-ESS2-1 • 2-ESS1-1 Designs are useful in communicating ideas for a solution to the erosion problem. Students define the problem of saving the sand towers from destruction caused by water. They design a solution that is based on understanding of all the components of the system the sand towers are a part of and that works within set limits and is based on evidence from prior tests. 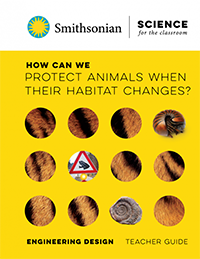 How Can We Protect Animals When Their Habitat Changes? Grade 3 3-5-ETS1-1 • 3-5-ETS1-2 • 3-5-ETS1-3 • 3-LS4-1 • 3-LS2-1 • 3-LS4-3 • 3-LS4-4 Problems are defined in terms of their criteria and constraints. Students define the problem of salamanders being killed on roads and work together to design a prototype that, as a complete system, meets the constraints and criteria of the problem. 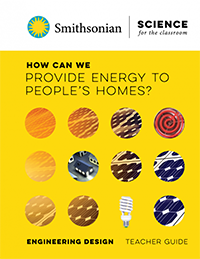 How Can We Provide Energy to People’s Homes? Grade 4 3-5-ETS1-1 • 3-5-ETS1-2 • 3-5-ETS1-3 • 4-PS3-4 • 4-PS3-2 • 4-ESS3-1 Electrical devices are designed to meet specific needs. In a written assessment, students design a solution for a family interested in installing solar panels. Their solutions weigh environmental effects and use models of energy flow. Groups begin their design challenge, developing a plan for solving the problem and using models to document their plan. 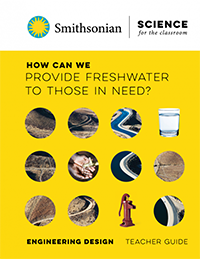 How Can We Provide Freshwater to Those in Need? Grade 5 3-5-ETS1-1 • 3-5-ETS1-2 • 3-5-ETS1-3 • 5-ESS2-1 • 5-ESS2-2 • 5-ESS3-1 Communication with peers is an important part of the design process. Groups of students evaluate information about a specific town in order to design a solution for accessing and treating water that meets specified criteria and constraints. Students analyze and interpret data to figure out effects of design choices in previous testing. 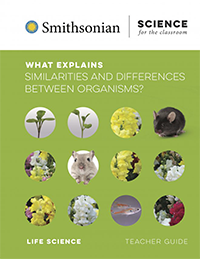 What Explains Similarities and Differences Between Organisms? Grade 3 3-LS1-1 • 3-LS3-1 • 3-LS3-2 • 3-LS4-2 • 3-ESS2-2 Guppies are brighter orange in one stream than in another, and the streams vary in a number of environmental factors. Students analyze data from field notes about the environmental conditions in two streams where their guppies live and ask questions about their possible effects. 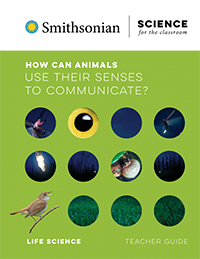 How Can Animals Use their Senses to Communicate? Grade 4 4-LS1-1 • 4-LS1-2 • 4-PS4-2 • 4-PS4-3 • 3-5-ETS1-1 Fireflies identify mates using species-specific flash patterns. for a model by identifying key components and interactions. 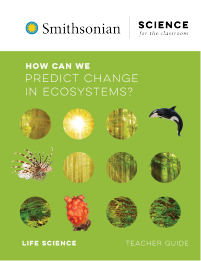 How Can We Predict Change in Ecosystems? Grade 5 5-LS1-1, 5-LS2-1, 5-PS1-1, 5-PS3-1 Sea squirts often hitchhike on boats and become invasive species. Students analyze and interpret data to develop and compare food web models of matter and energy flow in two coastal ecosystems. 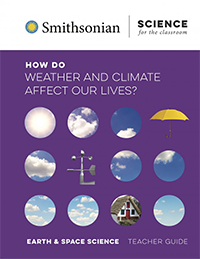 How Do Weather and Climate Affect Our Lives? Grade 3 3-ESS2-1 • 3-ESS2-2 • 3-ESS3-1 • 3-5-ETS1-1 Climate and weather data can be used to predict future weather. Students make a graph to show the pattern of temperature, precipitation, or hazardous weather for a city throughout the year. What Is Our Evidence That We Live on a Changing Earth? Grade 4 4-ESS1-1 • 4-ESS2-1 • 4-ESS2-2 • 4-ESS3-2 • 4-PS4-1 • 3-5-ETS1-1 Evidence of a changing Earth comes in many forms and can be found all around us. Students apply their understanding of evidence of change to new locations. They communicate information about patterns of fossils and rock features and patterns in map locations to explain that landscapes change. How Can We Use the Sky to Navigate? 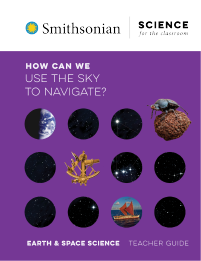 Grade 5 5-ESS1-1, 5-ESS1-2, 5-PS2-1, 3-5-ETS1-1 Observations of the sky can be used to navigate a boat. without instruments by using evidence that the patterns of the Sun and stars can be used to navigate. 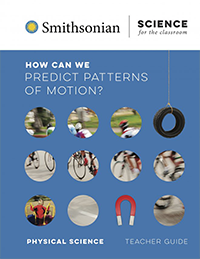 How Can We Predict Patterns of Motion? Grade 3 3-PS2-1 • 3-PS2-2 • 3-PS2-3 • 3-PS2-4 • 3-5-ETS1-1 Magnetic forces acting between objects that are not in contact with each other can be used to influence patterns of motion in predictable ways. Students ask questions about how magnets affect the pattern of motion of a steel pendulum. 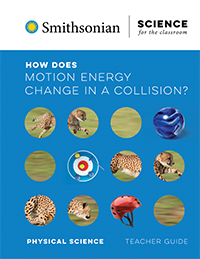 How Does Motion Energy Change in a Collision? Grade 4 4-PS3-1 • 4-PS3-2 • 4-PS3-3 • 4-LS1-1 • 3-5-ETS1-1 Speed and surface a ect how far an object will slide in a collision. Students plan and carry out an investigation to determine how speed and surface affect how far an object slides in a collision. 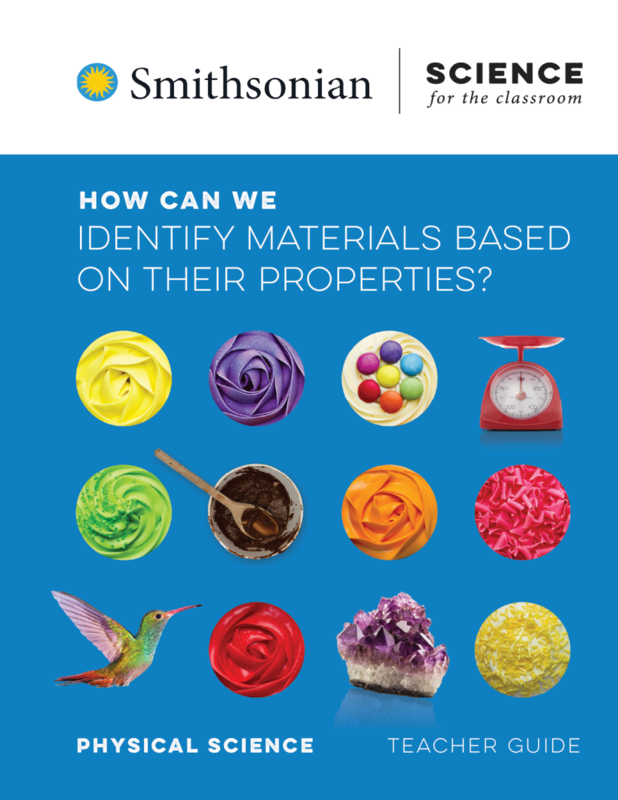 How Can We Identify Materials Based on Their Properties? Grade 5 5-PS1-1 , 5-PS1-2 , 5-PS1-3, 5-PS1-4 , 5-LS1-1 Unknown solids can be identified by comparing properties. Students carry out an investigation using a fair test to identify four unknown solids based on similarities and differences in properties.